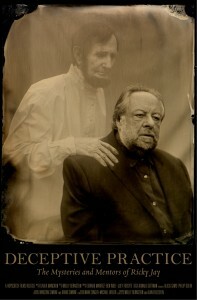 I have to admit that I am a huge Ricky Jay fan. I used to love to watch him back-in-the-day on the Dinah Shore show, his long hair flowing back off his shoulders as he flung playing cards to slice into the sides of watermellons. I caught his off-Broadway show Ricky Jay and his 52 Assistants back in the early 90’s (directed no less by his good buddy David Mamet) and was thrilled watching him in small yet powerful rolls in movies like Boogie Nights and House of Games. So seeing this documentary by Molly Bernstein and Alan Edelstein have its world premier during a press viewing at the NYC 50th Film Festival was a treat! Being a fan of old magicians I was as tickled that this movie was as much about Jay, quite an interesting guy, as it was about his influences. Meeting old time well-known (though not well-to-do) magicians as a kid because of his grandfather’s friendship with them, Ricky Jay got hooked on the art and was working professionally by the age of 7. Watching Deceptive Practice: The Mysteries and Mentors of Ricky Jay, it’s not difficult in the least to come away from this 85 minute film with an appreciation for the art of magic and the people who perform it.